Are you studying and would like to have additional income? Do you have a family at home, and would like a part time business? Would you like to OWN YOUR OWN BUSINESS but NOT be on your own? Would you like a STARTUP BUSINESS where just about everything is already set up for YOU? All you need to do is 2 days training, upon training completion take your equipment and stock away with you, all ready to go and change people’s lives one smile at a time. Are you looking for a CHANGE of direction in your life but you are not sure if you have the right experience? Great news is that experience is not a prerequisite as full training in NZCTWA practical and theory will be provided to an approved purchaser! EQUIPMENT is European made, with the highest quality, maximum power for safe but very efficient and faster results. The lamp has 119 LED lights with 3xmagnification lens, very flexible neck to maneuver the lamp in the most awkward of places, very light, on wheels, easy to use, and comes with a 1yr warranty. TRAINING comprises of practical, theory, marketing & advertising over 2 days. 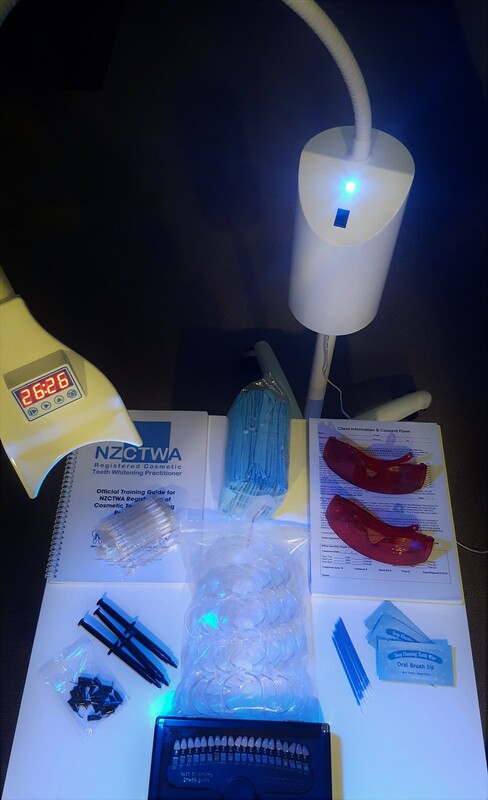 This will be conducted by only 1 of 2 qualified Cosmetic Teeth Whitening Trainers in NZ. Included is NZCTWA training for 2, up to the value of $900pp with certification issued on completion. RETAIL products are included for upselling to your customers. UNIFORM, 1 Sparklewhite Teeth embroided shirt or smock. WEBSITE Listing on our main website directing leads to you. OWN YOUR OWN STARTUP BUSINESS, BUT NOT BE ON YOUR OWN! We will send you an Information Pack upon return of our CA, giving you a list of everything that is included as well as a ROI (return on investment) chart of potential earnings.